On July 16, over 300 attended APA's 30th Anniversary Gala. It was a mini reunion of family, friends and associates of Dr. Wong, former APA Board members, management, and staff. Guests enjoyed an hors d'oeuvres buffet reception at the splendid Green Room, located in the San Francisco War Memorial and Performing Arts Center. We deeply appreciate Sutter Health CPMC's continued support as our Title sponsor. 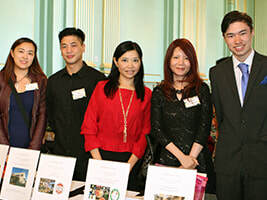 We would like to acknowledge the generosity of our sponsors and donors at the Platinum level - Gayle Chan & Eric Chen, Cary Chen & Celia Chang, Chef Cory Chen; Cathay Bank Foundation; Robert Joseph Louie Memorial Foundation; Gold level - ​HSBC USA; Recology; SHP Foundation; The Stanley S. Langendorf Foundation. Also very grateful for the support of our Silver and Bronze level sponsors and donors as well as Friends of APA and In-kind donors. Please scroll down for a listing. Click each link or each photo below to see different photo albums. 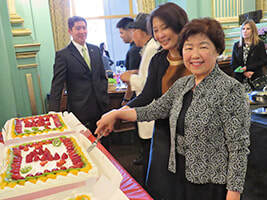 Mai-Mai Ho, APA's former Executive Director cutting one of three APA birthday cakes with Emerald Yeh, a long time friend of APA. 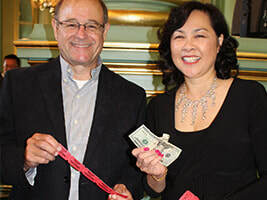 Rose Chung, Chair of APA Board of Directors selling raffle tickets to a guest. Delegates from the Miss Asian America Pageant are on hand for raffle ticket sales at the event. APA staff and two of our guest volunteers at the gift cards sales table in the foyer. ​East Star Building Supply Corp.
​Peking Arts & Crafts Inc.
Click photos or links below to see more. APA Founder, Dr. Don Wong, shares the story of how it all begun with the organization formerly known as Asian Perinatal Advocates at the Gala press conference on July 16. APA's Board of Directors at our 30th Anniversary Gala. 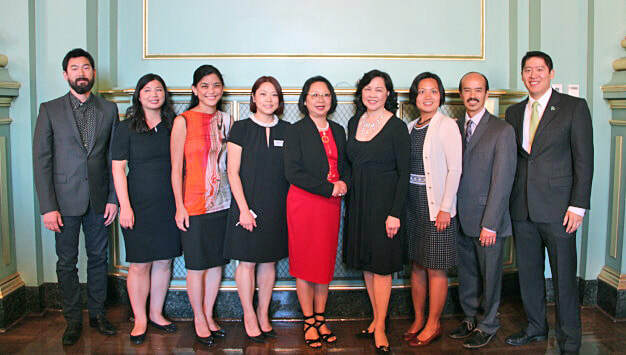 (L-R) Dean Yao, Jacqueline Huie, Mai-Sie Chan, M.D., Kory Lam, Joyce Tso, Rose Chung, Fanny Lam, Amor Santiago (Executive Director), Cary Chen. Not present: Van Diep, Stepehn Koh, Susan Sung.